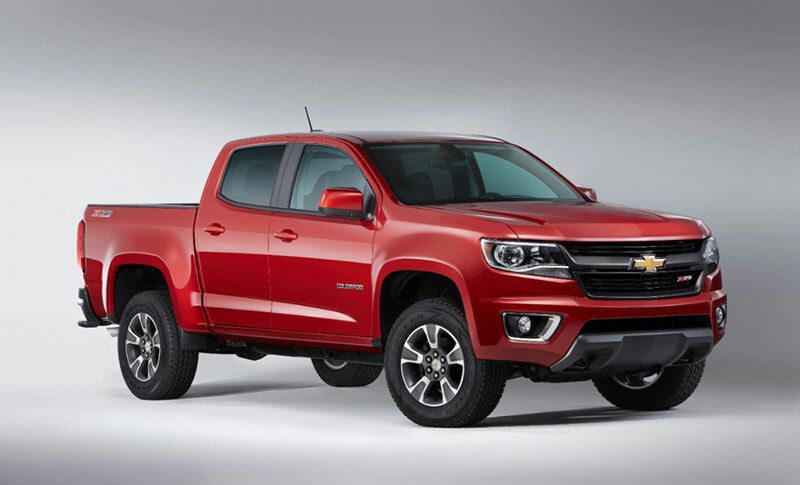 Suggested retail prices for the 2015 Chevrolet Colorado extended-cab pickup will start at $20,995, including an $875 dealer freight charge, Chevrolet announced today. Standard features will include a 200-horsepower 2.5L four-cylinder engine with direct fuel injection and continuously variable valve timing for strong midrange torque; a 6-speed manual transmission; power windows with express up for the driver; a rear-vision camera with dynamic guide lines; and a locking tailgate. Available options will include a 305-horsepower 3.6L V-6, also with direct fuel injection and variable valve timing; a 6-speed automatic transmission; 4G LTE with a built-in WiFi hotspot; Forward Collision Alert and Lane Departure Warning; and the GearOn™ accessory system, a comprehensive solution for organizing and carrying bikes, paddle boards and other equipment. Colorado customers can chose from two cab configurations, extended-cab and crew-cab. Crew-cab Colorados will offer a choice of 5- or 6-foot boxes; extended-cab models come with the 6-foot box. Other Colorado models also will offer great value. For example, the Colorado LT crew cab with 2WD and the 5-foot box has a starting price, including dealer freight, of $27,985. The Colorado Z71 crew cab 4×4 with the 5-foot box starts at $34,990. Colorado will be available in Chevrolet dealerships nationwide in the fall of 2014. Detailed pricing and EPA fuel economy estimates will be available closer to launch.